A Remarkable Prophecy About Joseph Smith? “Even before the Church was organized, it became clear that Joseph Smith was no ordinary young man. Although born into modest means and circumstances, he was quickly identified as someone special. The First Vision was an unexpected occurrence that not only changed his life forever but also changed the history of the world. His initial interview with the angel Moroni, occurring while he was just 17 years old, taught him that his life and work would not be usual by any measure. ‘He called me by name, and said unto me that he was a messenger sent from the presence of God to me, and that his name was Moroni; that God had a work for me to do; and that my name should be had for good and evil among all nations, kindreds, and tongues, or that it should be both good and evil spoken of among all people’ (Joseph Smith—History 1:33). In 1823, when Joseph was 17 years old, this declaration about the young man’s future widespread notoriety would indeed sound rather dubious. 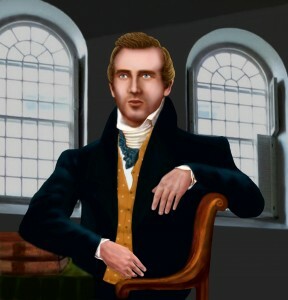 But Joseph Smith’s historical account wasn’t written when he was 17 years old; it was written in 1838 – when he was 32 years old. And by that time he was not an unknown teenager living in his parents’ home. By the time this account was written, Joseph Smith’s name was quite well-known—among his friends and among his many foes. According to Joseph, this prophecy was given to him during a trinity of nighttime angelic visitations that transpired in his bedroom on September 21, 1823. Other pre-1838 historic accounts of Moroni’s visits do not mention the prophecy at all, save one – a lengthy account written by Oliver Cowdery, fact-checked by Joseph Smith, and published in the Latter-day Saints’ Messenger and Advocate in serial form from October 1834 to October 1835. This account of the heavenly communication differs from Joseph’s 1838 account. There is no prophecy involving Joseph; there is no mention of Joseph’s name being had for good and evil; there is no suggestion of a world-wide scope of antagonists. Instead, Moroni tells Joseph not to be surprised (“marvel not”) if he is mocked and cited as a notorious person (“derision and by-word”) among those who seek the destruction of God’s [Mormon] messengers. This, of course, was not a new idea. Nearly two thousand years before this Jesus warned His people that they would be “hated by all nations” because of their commitment to Christ (Matthew 24:9). This is the earliest account I’ve seen that mentions a prediction that Joseph Smith would have fame among both followers and detractors. But even in 1835 (when this narrative was published), all of this was already a done deal. Mormon missionaries were actively proselytizing in the United States and Canadaas early as 1830. Newspapers all over the country began reporting on Joseph Smith and the Mormons beginning in 1830 (see Uncle Dale’s Readings in Early Mormon History). Ezra Booth’s nine letters written to denounce and expose Mormonism were published in the Ohio Star beginning in November 1831. Joseph Smith was tarred and feathered by a group of angry men in Ohio in 1832. Violent conflict between the Mormon and non-Mormon citizens of Jackson County, Missouri in 1833 led Joseph Smith to raise an army of 200 men in the spring of 1834, who then marched to Missouri to attempt to aid the Mormons there. E.D. Howe’s Mormonism Unvailed had been in circulation since October 1834. 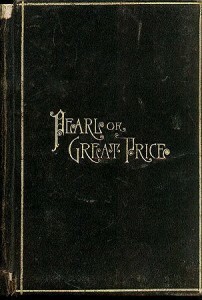 The book contained an unflattering history of the Mormon “delusion” and dozens of people’s sworn testimonies against Joseph Smith and Mormonism. Joseph Smith had 4,372 faithful followers by the end of 1834. Joseph Smith’s name was well-known in “the nations” of at least the United States and Canada. Some people in each nation believed him to be a good prophet who spoke for God; some believed him to be an evil imposter. His followers honored his name; his critics held his name in derision. It is no great feat to state the beginning from the vantage point of the end, nor to write a “prophecy” after it has been fulfilled. The “amazing prophecy” that Joseph Smith’s name would be had for good and evil among the nations was not so remarkable after all. 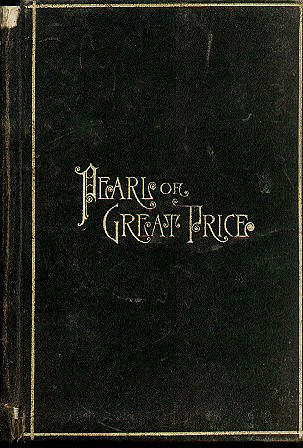 This entry was posted in D&C and Pearl of Great Price, Early Mormonism, Joseph Smith, Mormon History and tagged Angelic visits, Church of Jesus Christ of Latter-day Saints, First Vision, Joseph Smith, Mormon Church, Mormonism, Moroni, Pearl of Great Price. Bookmark the permalink. 10 Responses to A Remarkable Prophecy About Joseph Smith? With Joseph Smith what we get are a lot of do overs and back filling. It’s been pointed out that his first vision account expanded until there was something like eight different versions. Mormons like to say that he was just providing more “details”. Sorry that dog won’t hunt. Initially he had gone out to the woods to get assurance of the forgiveness of his sins. This was pretty standard fare in those days of revival in which he lived. In fact, Christian evangelist Charles Finney’s account is pretty spectacular in this regard. It makes me wonder why people believe in Smith’s story based on the feeling they get from it. The evidence is certainly not there to support his claims. I’ve often listed all of the angelic and other appearances of “beings” people have reported over the centuries. Any one of these is better than what Smith reported. Here’s the clincher. Smith was a practitioner of folk magic as was his family and close associates. He was known to use seer stones for everything from finding buried treasure to “translating” his golden plates. Did he make up the Moroni story or did a spirit being really appear to him? If a spirit being did in fact appear to him, what exactly was it? None-the-less, my bet is he fabricated the story given his track record of cunning and deceit. The Bible tells us that Satan will come in the form of an angel of light to decive. All evidence proves Joseph was decived by the devil and has gone on to decive the people. advertisement of Joseph Smith . ever since it was preached by missionaries 2000 years ago . It still does today . be ” in the truth ” and thus gain God’s favor . following Joseph Smith and his successors . I think it should be pointed out that Joseph Smith, as well as many early converts to his religion, saw all manner of spirit beings. Moroni wasn’t Smith’s only angel visitor. He also had an angel with a sword appear to him and threaten him with death if he didn’t practice polygamy. I’m trying to remember who it was that supposedly appeared in regards to the restoration of the priesthood. Was it Peter, James and John? Interesting video from the author of the above site. in 1987 ! 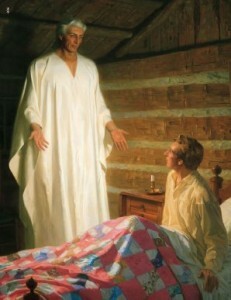 Visitation from spirit beings / angels is a popular activity it seems in Mormondom . Based on what these men teach it is quite easy to pin point what kind of Beings these were. They were not messengers sent by the true and living God , and that’s what counts . I suppose I should go down to the basement and get out my copy of “Temple Manifestations” written by a Mormon. It’s meant to be a “faith building” tome. I find it pretty creepy. From memory, I believe it was Wilford Woodruff, who reported that the signers of the Declaration of Independence appeared to him demanding/pleading that temple work be done from them. As I remember it, they were called “choice spirits”. There’s also stories of Mormons “seeing through the veil” in the temple while doing the work for the dead. They also saw “spirits”. Kind of makes you wonder who’s hanging around the LDS temples doesn’t it? lives , perhaps in the healing of their child , or rescuing them from a potentially fatal accident . this validates their leaders authoritative claims . It does’nt . appearance on the American landscape . Is Mormonism Christianity restored ? our day , is that true ? is proof that Mormonism is the truth , but those do not directly address the claims stated above . at the top as prophet . It’s all about Jesus for everyone . Jn 14: 6 ; Heb 7: 25 .
to be God’s mouthpiece through whom God would restore His Son’s church which had been overcome and died off 1700 earlier , but now salvation would again be available to mankind . Matt 16:18; Rom 1:16 ; 2Cor 5:18 ,19 ; Eph 3:21.
in order to gain God’s approval ( salvation ) . proceeded to introduced to those who followed him teachings that were not sound doctrine . offered was really only a substitution for Jesus’ church . The Mormon church and the gospel it’s leaders have preached is not the answer . It hit me this morning how Smith is much like Satan. Both wanted to be like God, and had very high thoughts about themselves. The ‘prophecy’ in this post is hardly newsworthy given the ego involved. I would suggest that maybe a follower of Joseph Smith might want to pray about this and see if it might be true. Then if they feel good about it, it is true. If they feel bad, it’s not true. But the clincher is to keep praying about it until you feel good, thus “knowing” that it is indeed true.